Hi, I'm Margaret, the Diva Chix Stock Broker. I work with the shop owners and am able to provide you with 48 new stock options every Thursday! I'll show you everything I have, but I am only able to release 2 of the stocks for sale every hour. So, if there is a stock below under "Releasing Soon" that you have your eye on, check back every hour to see if it's up for sale. The stocks listed in green are ones that you need for your current stock collection. The ones in red are ones that you already own. You can buy up to 3 stocks from me each week, so choose your purchases carefully. Don't panic if I'm sold out. You can check the Stock Exchange for good deals. To participate in the Diva Chix Stock Market, you need to own the Stock Queen upgrade. 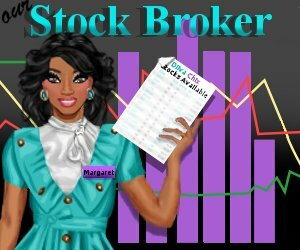 For more detailed information on the Stock Market and how to play, read the Diva Chix Stock Market. All stocks have already been released. Check back next Thursday for new stocks.